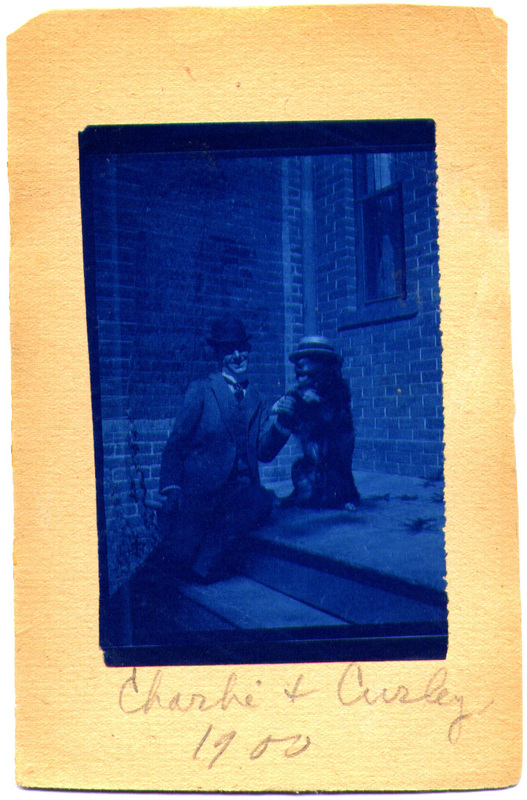 Charley and Curley, cyanotype, ca. 1900-1910. Photographer unknown. 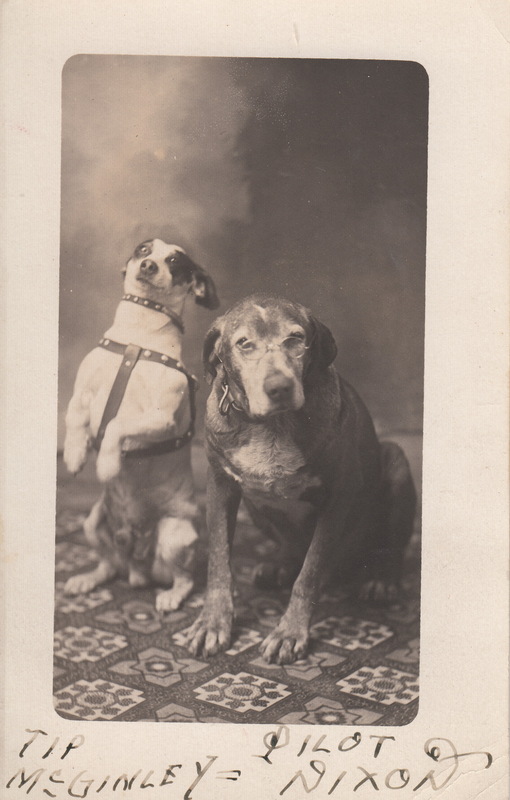 Looking through my collection of early photographs of dogs, it’s clear that lots of family pets were taught at least one trick — “sit up” or “beg.” I’ll be adding more photos to this album as I have time to scan them, and I’ll share advice on teaching dogs tricks from old books and pamphlets on dog training. “Charley and Curley 1900” is a cyannotype (a fancy name for a blueprint). A simple form of photographic printing, amateur photographers experimented with it for a couple of decades. This cyannotype isn’t even square, and it has an edge that suggests that the image was torn from a larger piece of sensitized paper. It’s glued to a piece of heavier paper. But don’t you love this picture of two dapper fellows. I’m assuming “Curley” is the dog. He’s wearing a straw boater, a popular summer hat for both men and women. Unidentified dogs and boy, Little Rock, AK, ca. 1910. Photographer unknown. 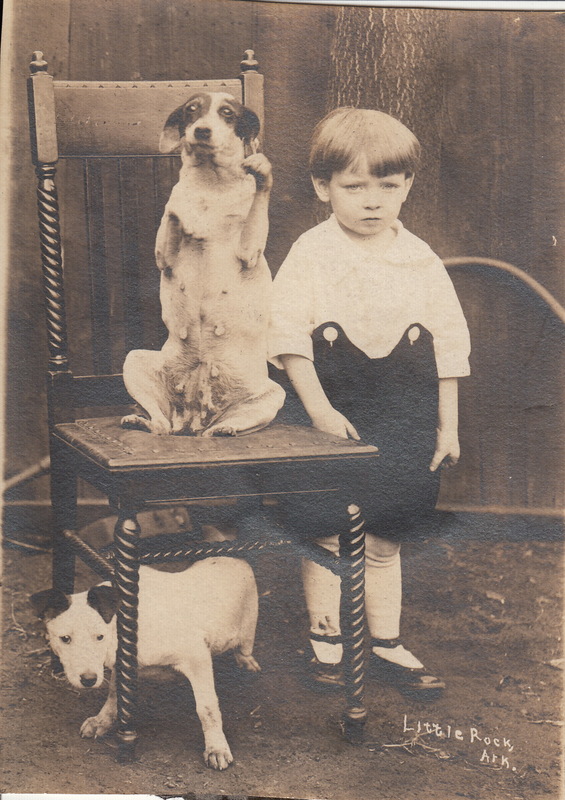 This real photo postcard shows a very little boy dressed in Sunday best short pants, white hose and patent leather “mary janes.” He’s been posed outdoors, against what looks like the side of a barn or shed, and a dining room chair has been brought outside to create the pose with the two dogs. 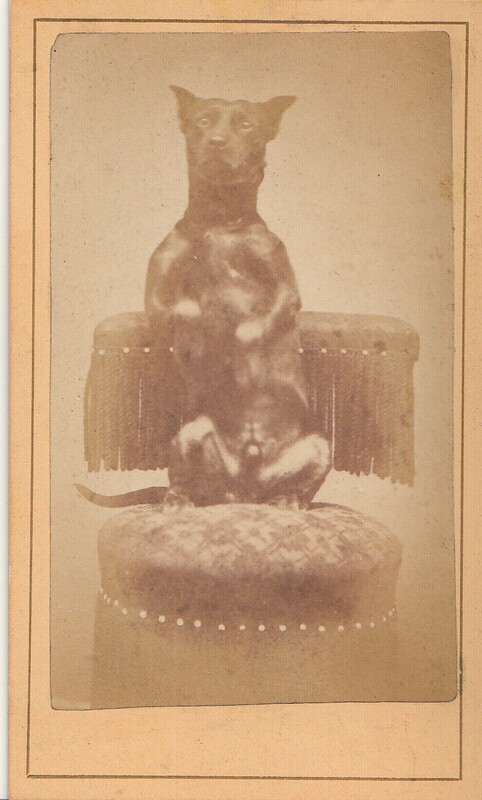 The dog sitting up on the chair has a very appealing expression. She has had puppies, probably repeatedly, since spaying wasn’t available widely until the 1930s. While Tip McGinley sits up, Pilot Nixon looks wise with a pair of spectacles on his nose. This is a studio photograph, unlike the previous two. What I like about the caption is that the dog friends are identified by both first and last names. “Tip McGinley and Pilot Nixon,” real photo postcard, photographer unknown, ca. 1920. This cdv has been trimmed to fit into an album, Notice that the man’s cheeks have been tinted pink. Both the man and the dog are looking at the photographer, and the little dog, a small female terrier (perhaps a brown-and-black Manchester terrier), has moved a little as she tries to keep her balance.